I'm fairly new to biking as I've only been riding for about 14 months. In that time I have rode in two races, the Maah Daah Hey 100 (25 mile length) and Lutsen99 (19 mile length). LOVED them both. My husband, Nick, and I recently completed a ride on the White Rim Trail with Western Spirit Cycling Adventures. If you ever have the chance….do it! We enjoy riding with our two boys. When your teenage boys thank you for taking them on a trip you know you are blessed! Some of our favorite places to ride as a family are Yellow River State Forest, Decorah Trails, CAMBA trail system and Wyalusing State Park. We are currently planning a trip this summer with them to Yellowstone and the Gravelly Range in Montana. We will bike and ride for the entire time we are gone. My husband and I have lost 160 pounds combined by biking. I have biked 1500 plus miles this year since May. It is not something I make myself do every day but rather an adventure that I love. When I ride single track that is all that is on my mind. I can not think about the things that are not done, bills that need paid, or what session we have next in our studio. My only thought is what the next line is and what I need to do to ride that. My husband and I have been blessed to mountain bike some of the greatest mountain biking spots in the US in the last year. When we stopped in Moab, asked for trails, and then said I’ve only been doing this for six months their eyes almost popped out of their head! If I can do it ANYONE can. Your #bikelife has been fairly recent- what was the inspiration to get started with your life on two wheels? My husband, Nick, and I decided to lose weight in 2015. Since then we have lost 120 pounds and it has been by riding bikes. It was a great way to get outside, enjoy what we were doing, and see places we had never seen before. You have participated in some events this year as a newer rider, what would you say was your favorite? This one is TOUGH! I participated in two mountain bike races this summer the Maah Daah Hey 100 and the Lutsen99er. The Lutsen99er was first and it was a GREAT experience. I raced in the 19 mile race which was perfect for my first time. The staff was amazing and course was perfect for starting out. I really can’t say enough good things about this race as we were as encouraged and supported as the 99ers coming in. So cool! The next race as the MDH100. We went to Medora and the Theodore Roosevelt National Park a week before the race to explore. Coming from the Midwest the MDH trail was different! It was tougher than I imagined it would be and honestly I was not sure this was something I could complete and compete on at all. 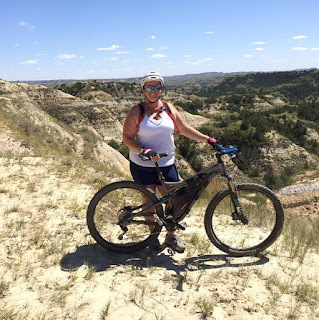 My goal was never to win but to finish and enjoy it……… After riding the trail for several days I competed in the 25 mile length race. LOVED it! It was the hardest thing I have completed as an adult. The MDH is grueling and unforgiving but touched my soul in a way that no other trail ever has. There was something about riding alone through the prairie with no other sounds than your tires rolling through dirt that touches your heart. What helped you with your decision to participate in an event? What advice do you have for those who are still nervous about participating? I would have never participated in an event without my friends on Facebook encouraging me. Honestly I did not know where the events were or what it really even meant. (Still wasn’t sure what it meant when we arrived at the starting line in Lutsen). Heck yea I was nervous. Scared was probably a better word lol….Just do it! It’s fun, everyone is happy, and you will make memories that will last you forever. Do you remember how you felt on your first mountain bike ride? The first bike we bought me was a cross rip. Great bike and I was excited. We rode on our local trails I had rode my horse on as a child. After the ride I was not so thrilled at all. 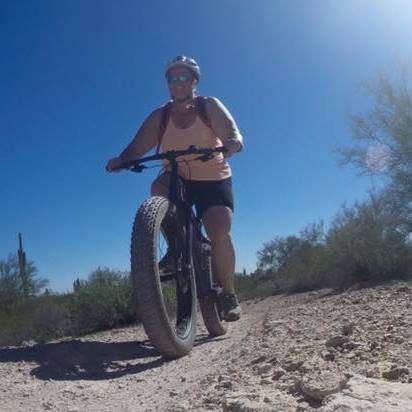 I had seen a fat tire bike and wanted to try it. Those turned out to be the most expensive words of 2016. Fat bikes for our entire family now and we all love them. I have a Spearfish, named Merle, that I am hooked on. The first time I rode Merle was like freedom. I could go on any trail that I was comfortable on and had a bike that was capable of far more than me. If you had nervousness at all, what did you do or think to overcome it? I’m a pretty gritty person by nature. Once I set my mind to something I do it. I was nervous and still get nervous but I try really hard to just work my way through that line or obstacle one piece at a time. Do I wreck-heck yes…..do I try again-YES. It’s just a matter of saying I am going to do this. I also watch lots of you tube videos of people far better than myself riding. I think that has helped me see lines and see that other people do this all the time….so can I with practice. Clips or flats? What do you use and why do you like them? 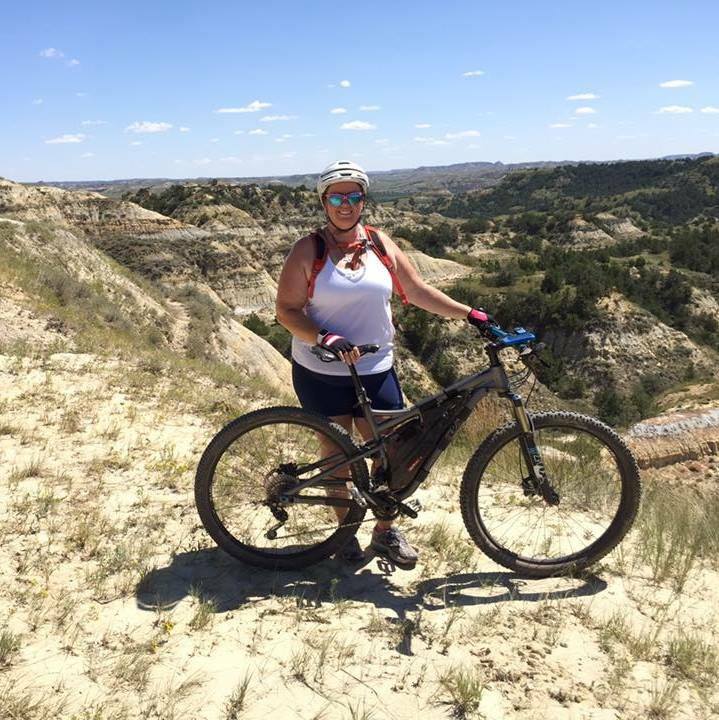 Flats all the way on the mountain bike…..I like knowing I can put my foot down at any time. I’m using a pretty aggressive clip that Travis recommended on the mountain bikes. I use clips on the gravel bike just for pedaling efficiency. Have you had any biffs that were challenging for you on a physical/mental/emotional level? What did you do to heal and overcome? Yes, I went over my handlebars in late July. Totally crashed in front of my children while coming down a steep hill. I had not checked tire pressure earlier when we left and my tire rolled. After confirming that every body part still worked we rode the rest of the day. I ended up rotating my spine and pulling some back muscles. It hurt and frankly it scared me. We left for North Dakota the following week to race the Maah Daah Hey. I had wrecked in a rut and was really frightened of doing it again. Well the MDH was the perfect place to go! There are ruts that are 3-4 feet deep and they are frequent. Needless to say by the time we got home I had worked that problem out in my mind. The physical healing just took time but this was also the reason I sat out the Short and Fat in Hayward in September. Tight turns and switchbacks have always challenged me more than they should. Steep downhills also challenge me but the biggest challenge is uphill as I have asthma. I took a clinic in Minneapolis this August. It was a game changer for me. I learned skills that have helped so much! The clinic as for women only so there was no pressure to keep up with anyone and I would recommend it or something similar to everyone. Switchbacks still are tricky. I also struggle with large rocks going up or downhill. I have learned that I don’t have to be fast and I don’t have to ride at anyone else’s speed. Since I learned that in places like Moab I will ride the same obstacle over and over until I get comfortable with it. That has helped me a lot. What has been the greatest part about having your partner also be your riding partner? What’s better than to share something you love with the one you love most. Nick and I recently completed the White Rim Trail in Moab, UT. I was so proud of our experience together. It was mind blowing to not only see that part of the country from a bike but to do so with the man I love most. Your kids are involved with riding as well, what suggestions do you have for parents who would like to foster some #bikelife in their kids? Encourage them, get them quality bikes, take them places that speaks to their abilities and likes. Our boys love single track so we take them to the CAMBA trail system, Decorah, and FDR in Dubuque. By taking them to trails they love they experience the same freedom and passion we do. We also had them go to bike camp last summer. The first words we heard when we picked them up was “Can we come back next year”. That tells me they loved it! They always thank us after each ride on their own. If your teenagers are saying thank you without prompting you know they love it to! It’s my time and freedom! I love single track. When riding single track there is not another thought in the world to me. Everything melts away as I ride. Doesn’t matter what bill is not paid, who needs to book a session when, what child has practice……it is only about what the next turn brings or what gear I need to be in to get to the top of the next hill. I love that feeling and hope that I never lose it. 1-Salsa Beargrease- “Greasy” Greasy was my first bike that I rode a lot. I think we probably rode everywhere we could last winter. Being a carbon bike has made this bike so light that it’s like having a fighter jet under you. 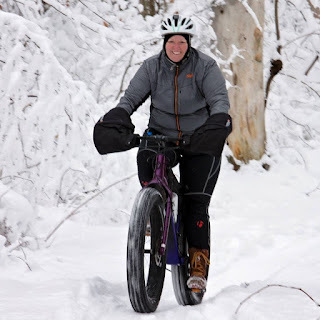 I chose this particular bike because of it’s nimbleness and that the fat bike gave me confidence that I would not have achieved as quickly as a 29er. 2. Salsa Spearfish-“Merle” Merle is my full suspension 29er. I rode a rental bike in Sedona last winter that was FS. LOVED IT! It was so much faster than what my fat bike was and such a different ride. We started looking at bikes and I test rode a spearfish. Merle is just plain fun. There is more bike there than I will be capable of needing for awhile but this is the bike I would take out west if I only could take one bike. 3. Salsa Fargo-“Waylon” I want to ride gravel races this year. My goal is to ride a 100 mile gravel race by the end of next season. Land Run 100 is on the agenda for 2018 so I better get riding! What clothing/bike accessories do you love? What would you recommend to your friends? I have not wore kits in the past to ride…..I’m not a smaller built person so the kits that I tried were not comfortable. I have since lost weight and bought a couple of jerseys so looking forward to them next year. I wear padded shorts and a comfortable wicking shirt or tank top. I have a Brooks Saddle that I love on every bike. I love my Garmin, although I probably use it to only about 50% of its ability. I would recommend the same to my fiends. What do you feel deters women from getting involved with cycling? Especially mountain biking? I think fear of the unknown deters them. Women, at least my fiends, like to know what is going to happen and where that will happen at. Mountain biking is not that at all….things change and happen fast. BUT once women get through that fear I think that is why they love it also. I think women need to see other women like them out riding. Women need to realize that this is your chance to go have fun at your own pace. It’s not a race and the only one judging you is you. I love the feeling of serenity I get from riding. I want other women to find that same peace of mind. Also the fact that this hobby has helped me lose 50+ pounds inspires me to want others to be able to do the same. I am the queen of crock pot cooking! Winter Riding and Perfectionism Don't Mix. Keeping the Stoke While Battling Burnout.